To celebrate a year of blogging, I want to give you a present! I’m super excited to be hosting my first ever GIVEAWAY! And actually, we’re also celebrating the fact that a month or two ago, I won my first giveaway (who said being a podcast nerd doesn’t have its perks?). 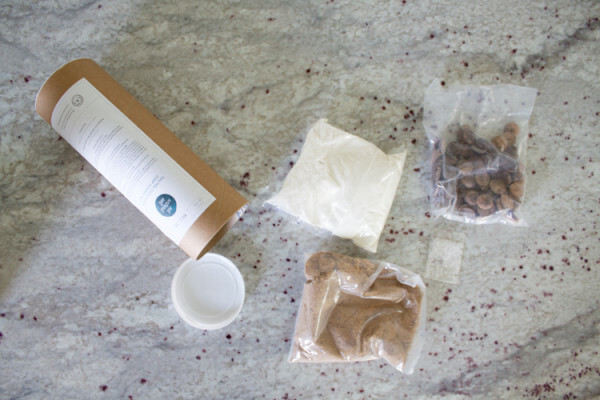 I got a very exciting package in the mail – this really, really awesome Salted Chocolate Chip Cookie Mix made by the folks who blog at Not Without Salt. I mean…there are actual vanilla beans in there. And look at those chocolate chunks. And the cutie little packet of flaky sea salt. …and perhaps a helper. I have to admit, it was kind of awesome not having to measure anything. She basically did the whole thing herself! I mean, she’s 4 now (somehow?!? ), so I guess baking cookies on her own can be a thing? And let me tell you…those are some good cookies. I love the dark chocolate and the sweet/saltiness and the perfect soft, chewy texture. Yum!! To win the cookie mix, all you need to do* is leave a comment below telling me the food you’re most looking forward to eating this week! It could be something you’re cooking or a restaurant meal…I want to live vicariously through your food loves. :o) I’ll randomly choose a winner on Monday, October 5! Stay tuned throughout the week for some highlights from the last year! I’m so happy to be celebrating this birthday with you all! *This giveaway is open to readers in the continental US only. Sorry bout that! My grandma’s recipe of Swedish meatballs and garlic mashed potatoes! Oh yum! I bet those are awesome! Those look amazing! One of my favorite meals we have lined up for this week is Ham Delight Rolls. Easiest dinner ever with some fruit and a salad as sides, and who doesn’t love a good Ham Delight Roll (or five)?! Bahaha, yes please to 5!! You need to send me your recipe, I don’t actually think I’ve ever made them myself…just consumed them in more-than-my-fair-share quantities at parties…?! Fall temps and rain have us craving chili this week! Thanks, friend! Chili needs to be on our menu, too. Yum! Happy One Year of blogging! My baby is turning one on Friday, so I’m looking forward to a treat-filled breakfast with him. Trying to decide between pancakes, waffles or donuts! Aww, happy birthday to your sweet guy, too! These look amazing!!!!!! I would love to do these with my 5 year old. She’s an amazing helper in the kitchen as well. If I don’t win, I’ll probably need to bake my own not-as-yummy chocolate chip cookies to consume (or just a handful of chocolate chips, haha). These look too delicious! 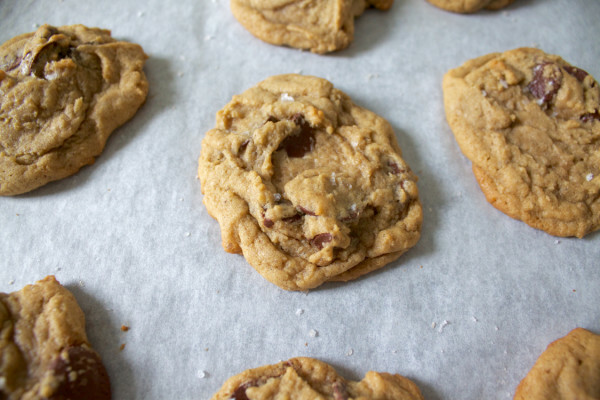 Yess, sometimes the handful of chocolate chips is the way to go. Or the spoonful of peanut butter + the chocolate chip dippers?? My 5 year old would go crazy for this mix! This week I’m looking forward to making and eating chocolate cake tomorrow night for guests. My recipe uses coconut flour and honey and it’s so good! 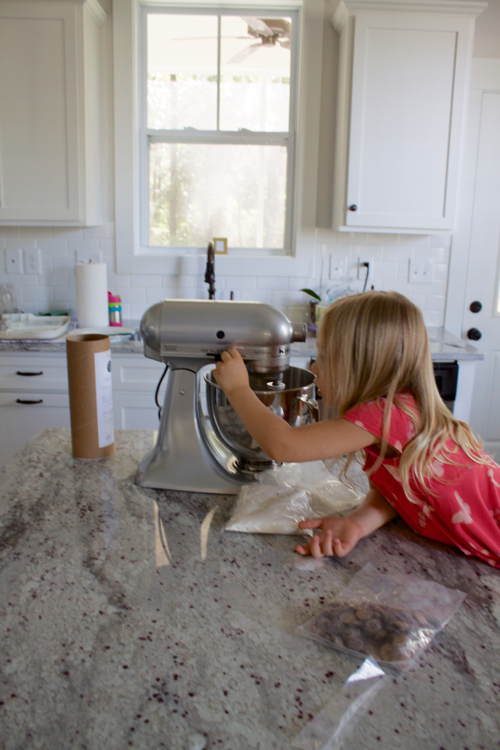 Becky, she really would – it was so fun to watch my daughter open the tube and get excited about each ingredient! Your chocolate cake sounds a-mazing! The best. So glad you are so well-loved by so many! So.much.rain. We’re having white chicken chili on Thursday (new recipe) and it just sounds so good with this dreary weather. Let me know if the recipe is a winner! I’ve tried a few white chicken chili recipes but don’t have a standby one! Looking forward to ahi poke with Asian chopped salad this week! Very little inspiration last night when menu planning-hence all the repins from your boards 🙂 Looking forward to baked ziti and some homemade bread-carbs, carbs, carbs! Carbs are our very good friends. Thank you for existing, carbs! That sounds like the perfect meal for this rainy week! This rain, rain, rain, and more rain has me craving soup. I’m thinking we’ll have our first pot of chili of the season this week…with cornbread, of course! YES! It’s time! Chili season, woohoo! I take Step 2 of my medical boards tomorrow, so tonight I am loading up on the hearty goodness of a big pot of chili! The aromas have been dancing through our house all day, and I cannot wait to dig in. Girrlll, I hope it went awesome! Chili sounds like the perfect pre-game food to me! Thank you, friend! Your quesadillas sound amazing! Yay! Happy 1 year! These cookies just made my mouth water. I am most looking forward to eating taco salad tonight. Taco Tuesdays may always be my favorite. Hooray for birthdays! I am most looking forward to our anniversary dinner at fig tree restaurant in Charlotte. Great food that I don’t have to cook! Happy anniversary to you! A night off of cooking is the best! That sounds like the perfect fall dinner! Yum! Thanks, friend! Yeah, they really should figure out how to feed people in the hospital something that tastes good!! So glad you get a homemade lasagna, that sounds amazing! Yummm. Is it kind of like a thick soup and then you put it over biscuits? That sounds SO GOOD right now! I am looking forward to eating the ginger molasses cookies that are always brought to our RUF large group by Wilson Presbyterian Church! Hmmm, I haven’t menu-planned or grocery-shopped for this week yet… but this morning I passed Aldi and had an actual Pavlovian response and was suddenly longing for some chocolate-covered pretzels. Get in my belly! Bahaha…I wonder if they’re the same as Trader Joe’s brand chocolate-covered pretzels?? So good. I’m ALWAYS in the mood for Mexican. Yum! Go Bet! It has been so much fun (and so delicious!) reading your blog this past year! Yum, I love a good baked potato. Thanks for your sweet note! Haha, thanks to all these comments I’m making chili this weekend! Love that Josie loves the bread – she has good taste. Miss you guys! Yessss, it’s October so it’s officially pumpkin bread season! I neeeed some soon! Nachos – cooked ground turkey and fajita veggies, baked in the oven with cheese and salsa over tortilla chips, topped with sour cream. Just missing the lime and avocado this time. I’ve enjoyed your blog! Yum! That sounds awesome. Do you put them on the chips before you bake or just dip afterwards? I’ll also make bruschetta using fresh basil from my back porch, juicy tomatoes from beechwood farms and Italian bread from Aldi! That sounds fabulous! Definitely going to have to try that. Thanks for sharing the link! I’m looking forward to making creamy garlic chicken. Yummy!!! Bet, this is the pin you saw on my pinterest. It’s so yummy!! It’s wonderful (and pretty) served over a bed of mashed potatoes, and I usually serve it with broccoli or asparagus. I was hoping that was the one! Definitely going to have to try that! That sounds so good! YES, it has been raining like crazy here, too…I need some good grilling weather! Ooh, that sounds intriguing! What are you putting in it?? Leftover crockpot roast! No work dinner times two!! So proud of you, Bet! Your blog is the one I most love to read, and I know your cooking is always real. And so glad I can at least look at your delicious food when I can’t eat it. I’ve got some homegrown apples and plan on making a schnitz pie later this week! I am looking forward to eating some pumpkin fudge that I just found a recipe for. I am going to make it this weekend! Oh wow, I bet that’s amazing! I looked forward all week to a lunch out with our intern, Jennifer. We went to McAlister’s and it reminded me of the one close to RTS. Good memories! You are my favorite blog (and truly only blog that I always read — I’m a slacker on the blogosphere). I tell people about BetonDinner all.the.time. You rock. It’s not upcoming, so maybe it doesn ‘t count, but I did anticipate the awesomeness that is Nana’s Potato soup on Tuesday, leftovers Wednesday, and hopefully there will still be some when I want lunch tomorrow. It’s a staple in the Icard house! So, thanks for dinner! Taco Casserole with a salad. I made a bunch of meals ahead of time to take to the beach and since we are leaving a day early, I look forward to eating this meal after a day of traveling because it is delicious and because it is already made. Congratulations on celebrating your first year of Bet on Dinner! So happy for you! Umm, genius vacation move! I love that! Yeah!!!! HBD to one of my favorite blogs!!! I am looking forward to making my mom’s pot roast. It’s clean out the freezer time at the Wilson’s. Got to get some fresh food in there for when the babe arrives. Soup! Tomato soup with tortellini- my fave- don’t tell jonathan- he’s not a fan of soup! Yum! That sounds so good right now! In my vast preparations for Hurricane Joaquin this week, I’ve lined up “Nanas Potato Soup”. Hoping it keeps us warm through the torrential sprinkles we’ve been getting. I love you and your blog and am living vicariously through all your delicious meals and your enthusiasm for making them! My favorite meal this week was dinner at Outback Steakhouse, a once-in-a-while treat! Thanks, Bev! :o) I do love a meal out, yum! I am prepping my grocery list right now… and excited to be making spaghetti squash and meatballs! Ooh, yum. How do you cook your squash?